2 Blemished Available: From $188.96 This item is available as a Blem/Refurb. These are items that cannot be sold as "New" merchandise and are limited to stock on hand. See the product details for a description of the product's condition. Note: The Scorpion Belfast runs slightly small. If you are between sizes, order the larger size. Good looking helmet, leather interior feels very high-end. However, the sizing is way off. I have 2 HJC IS-33 II's, a small and a medium. On my head the small is too snug and the medium is maybe a touch too loose. I tried a medium and large Belfast - I couldn't get the medium on and the large felt like the small HJC, and there was no way I could wear sunglasses which is a huge con for me. I will be returning. Extremely nice helmet! Had originally ordered the XL but was just a tad too tight. Exchanged for XXL and it fit perfect, and I mean perfect! The pearl white and grey accent color also matched my 2009 white and silver platinum pearl HD Ultra perfectly! Well made and love the leather! The shield works great and does not contact my glasses. Agree with others that wrote a review on the availability of a clear shield for night riding! Regardless, it is now my go-to helmet from here on out. There was.no hassle with the exchange. RZ makes returns super easy! Thanks to the RZ staff.Write your review here. It must be at least 25 characters long. Consider whether you would recommend this product and what you like or dislike about it. This is only the 2nd open face helmet I have worn but it FAR surpasses the last one I bought. Very comfortable fit, finish is fantastic, and I really like the style. It stays put even at 60+ mph and doesn't "float" like my last one did. The leather cheek padding is really comfortable as is the chin strap. All in all a top notch helmet, I just wish it had vents of some sort. Beautiful helmet with integrated shield! Runs small but exchanged size with no hassle med fit great!!! I have a big noggin and the XL Scorpion Belfast fit me perfectly. 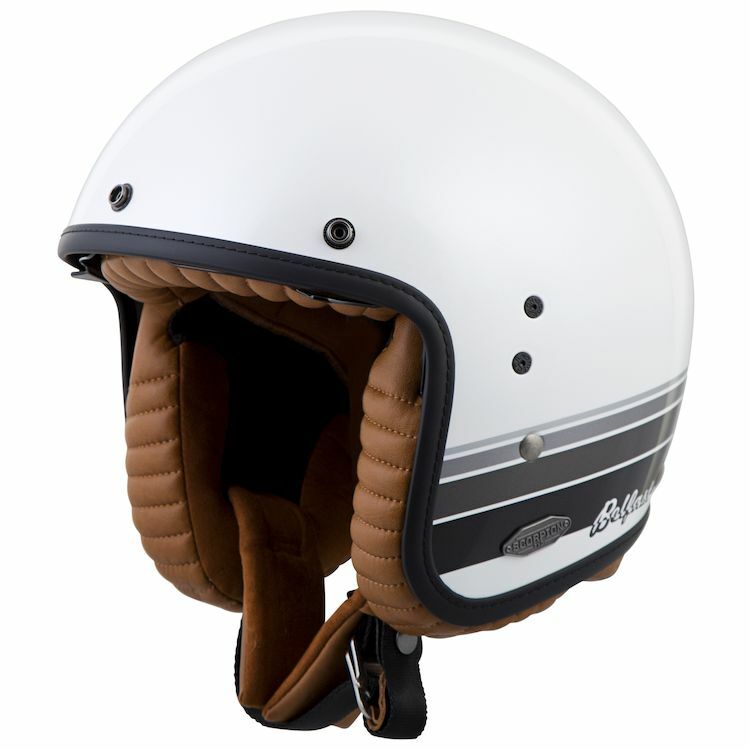 The fit and finish of this helmet is far better than the industry leaders, although this price is nearly double. I found this helmet to be extremely comfortable and I love the extra padding and low wind noise (for an open face helmet). Even with the retractable visor the Belfast doesn't seem to fit much higher on my head than other DOT competitors. I love the visor as it enables me to wear clear safety glasses and pull down the tinted visor as needed. This is a fantastic feature. Be aware that the white is very pearlescent. I would prefer a vintage off-white for myself, but the features and fit make it worthwhile. Looking for a vintage/retro cafe racer look? I love, love, love this helmet! 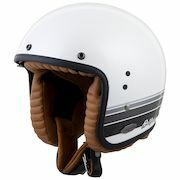 It goes great with my Triumph Thruxton for the old-school look and is quite comfortable. My only complaint--if it's really any complaint at all, as you should know what you're getting into if buying a non-full faced helmet--it can get quite noisy when riding above 4th gear. First Nappa Genuin Leather motorcycle Helmet ! Its a pretty helmet, I did find out that, Scorpion, tells you to please ignore directions in instructions, that come with helmet, That the Headliners & cheek pads are NOT ! Washable ! they are Genuine Leather. It don't feel like other helmets, almost like no need for break in time, like all of my other helmets ! I'm really Happy, it has the Three major things I had to have : Comfort/Quit/Protection ! Hand Laid Fiberglass, absorbs Shock Impact !